This is the official discussion topic of the Call of Duty: Infinite Warfare Trainer and Cheats in the WeMod app. Please post any suggestions, bug reports, or praise that you may have for the cheats in here! Do not enable all cheats to avoid crashes. Hope to see few more options, if possible. But anyway, thanks for the trainer. Of course. Game has anti-cheat, finally had to use the anti-anti-cheat capabilities of v2 Without v2, this trainer wouldn’t even be possible. Unfortunately, this trainer doesnt seem to work when I try to use it. My ammunition is still consumed, and my health still decreases as normal, for instance. When you press and toggle the trainer key (F1, F2 etc…), does it make a beep sound ? Do you get any error message as well ? Do you have the STEAM copy of this game ? Yes, it is the Steam version. Okay. Then kindly wait for STN to reply back. He is the trainer developer, so only he can help you out with this issue. Try clicking on the cheats to remap the hotkeys. @User2428724 Do you die? Your health might appear to decrease (screen turning red) but you won’t die. If you do die, let me know. As for ammo, i just find out it only works for certain weapons and not all, so switch to others and see if it works. Pushing an update tonight. hi is it safe to use this if it works in zombies solo mode? No it’s not. It was not meant to be used for zombies or multi player, it was only meant to be used for Singleplayer. If it works for Zombies and you use it for that then you shouldn’t blame WeMod, it is not safe as it’s connected to the internet 24/7 and the games are cloud saved on their server and they can check the game to see if you’re modding or not. WeMod does not create trainers for multiplayer use, it’s singleplayer only and should only be used for singleplayer games. If games have multi and singleplayer and there are trainer for that game they are intended for the singleplayer only, if they work multi then it’s the companies fault but you should still not use it for multiplayer cheating. 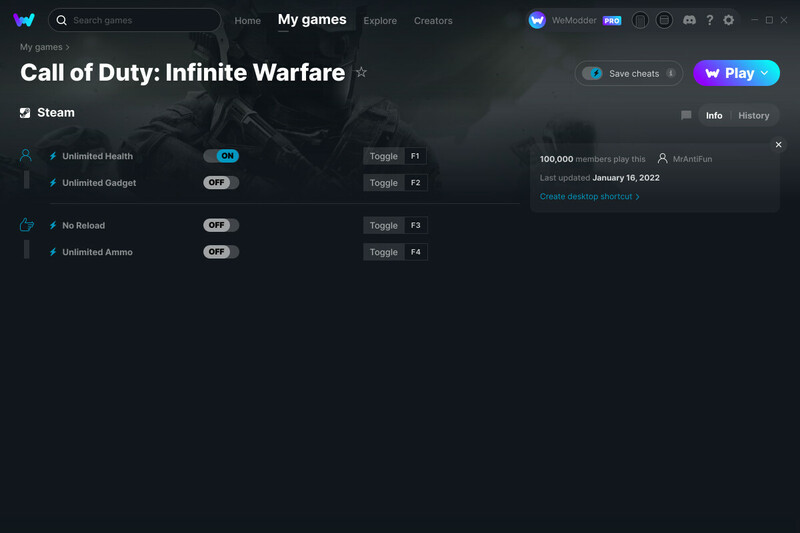 Ininity can’t find CoD IW, i own it in win store. I think it is because the .exe-file is named as “iw7uwp_ship.exe”, not as “iw7_ship.exe”. I can’t rename the file and manually selecting the Game folder doesn’t work. Yes, I still perish as normal. And I’ve noticed something about Infinite Ammo: when I toggle the cheat on, my spare ammunition is actually reset to 0, giving me less ammo than I started with! Suffice to say, I can’t reload. Switching weapons or picking up new ones does not alleviate this issue. obviously i’m new here, so just a question (and curious). why not just have a standalone trainer like others out there, rather than a centralized hub of a menu that requires a login to access other trainers. thanks. We can release trainer updates seamlessly. You don’t have to figure out your game version because Infinity does it for you. This goes along with the automatic updates because you don’t have to go searching for a new trainer when a game updates. We can show all the trainers of games that you have installed that we support, in one place. If there’s ever a bug or compatibility issue with future versions of Windows, a single update can fix it. You can control cheats using your phone/tablet with a Pro subscription. This wouldn’t be trivial to implement without the unified platform we created. We want people who have never used a trainer before to be able to cheat without knowing any technical details about their game, like the version, process to attach to, possibly EXE location, etc. Steam version of the game. When I load the trainer, the game crashes as soon as I try to fire my weapon. Just locks up and I must kill it.